Magento follows PSR-1 and PSR-2 coding standards and therefore recommends the use of the PHP Code Sniffer tool that will scan the code and identify inconsistencies and errors for manual editing. Each Magento 2 installation comes with preinstalled PHP Code Sniffer and a custom rule set with the code sniffer to be confident that your code meets all Magento-specific standards that can be used. 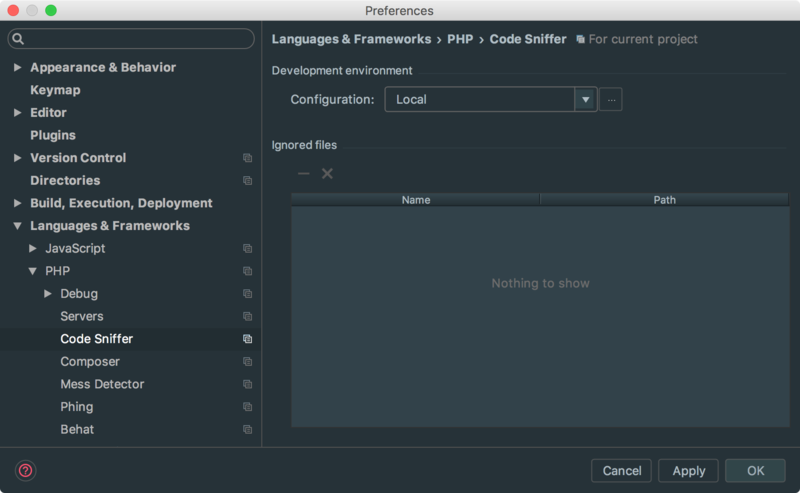 In PHP Storm IDE preferences go to Languages & Frameworks / PHP / Code Sniffer and open Local configuration. The next step would be to define what standard to use. In the preferences go to Editor / Inspections / PHP / PHP Code Sniffer validation. This Magento standard is defined as a specification that brings your PHP coding style closer to Magento PHP standards. This is more specified and more strict coding standard that’s used for Magento extension quality inspection. 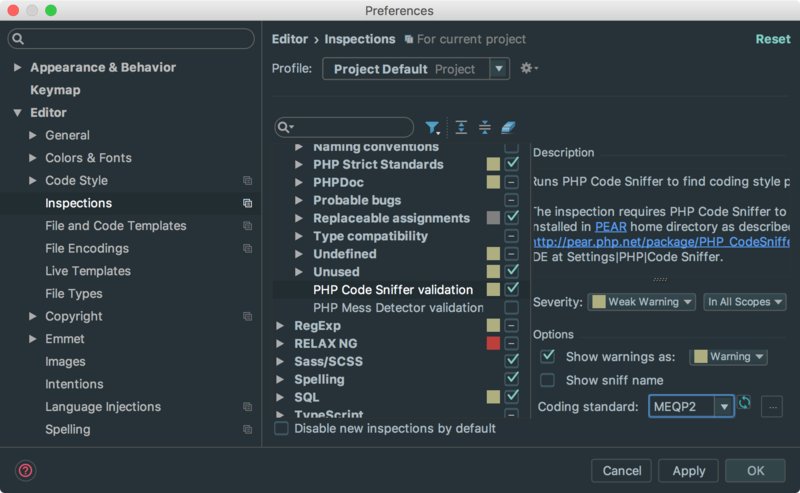 Next, in the preferences go to Editor / Inspections / PHP / PHP Code Sniffer validation. 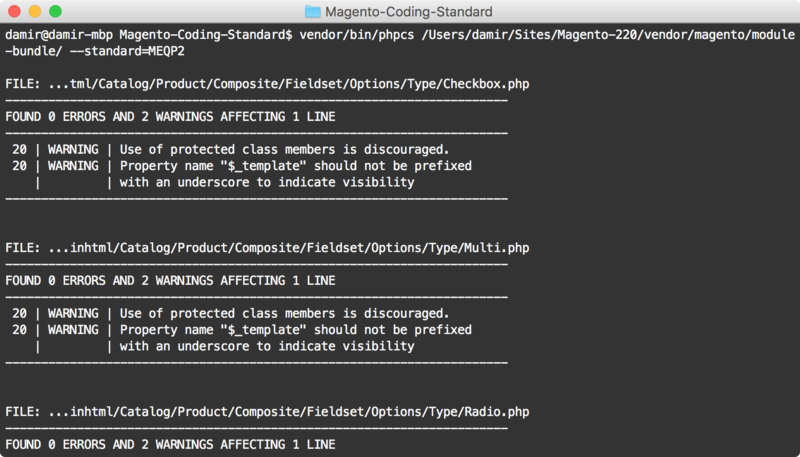 Magento standards will be available as options for Coding standards. From dropdown select MEQP2 for Magento 2 or MEQP if you’re using Magento 1. By default, PHP Code Sniffer will check for .inc, .php, .js and .css files. Design templates can be added by specifying --extensions=php,phtml option. The result will be displayed in CLI as shown on the image below, specifying errors and warnings for each file from the defined directory. Both standards come from Magento and having its custom code standard packed within the installation will be enough to follow when writing code. However, submitting extensions is much stricter and requires to be run with MEQP standard. Even though it requires a few more steps in order to configure it, MEQP standard is recommended to be used always, even if you’re not going to publish extensions. Being more strict will make you write the better code. Code that will or at least should be forward compatible, that will stop you from using danger or deprecated functions and make it more readable to everyone… and even to you, too. But I did not get what do you mean by Html tags and attributes? I want to run phpcbf for autocorrecting some of warnings.